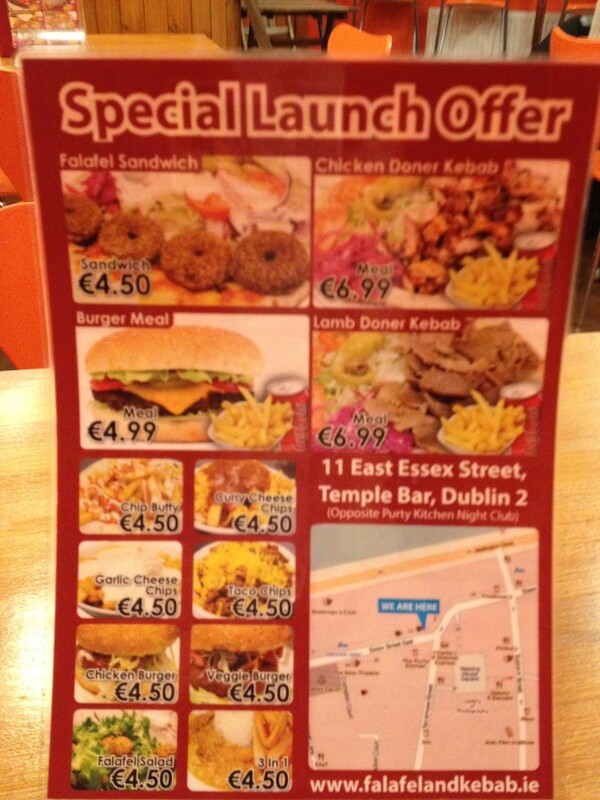 My mouth is still tingling, in a good way, thanks to Jean of the superb website cheapeats.ie who recommended that I try today’s eatforafiver venue. 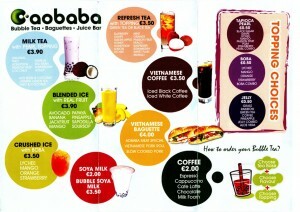 Aobaba is on Capel Street, close to the junction with Mary Street and on the opposite side of the road to Lenehans. It’s Vietnamese, distinctive, stunningly good value, seats about 20 and it’s open from 11 to 9. 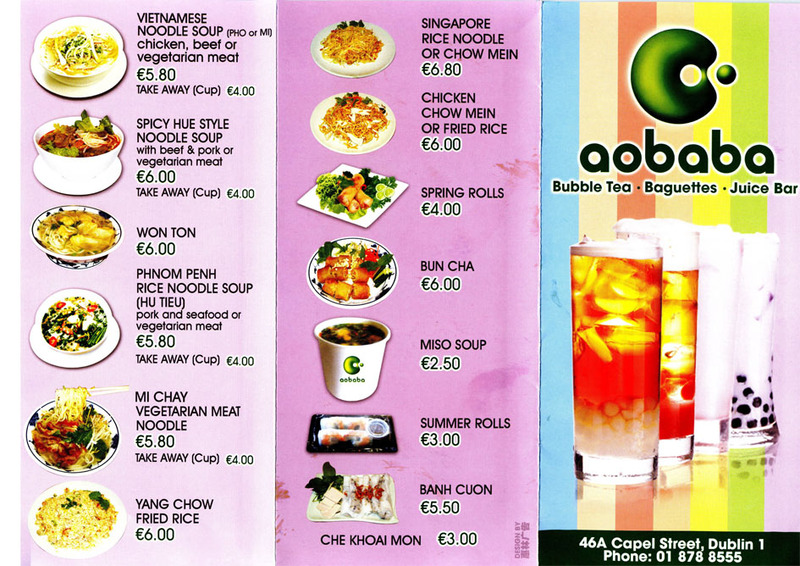 Those bowls you see on the first page of the menu are ENORMOUS, packed with goodies and evidently pretty good, judging by the sounds of satisfaction emanating from the customers in possession. They cost €6 or less. I kind of regretted my self imposed budgetary limit. Especially as I was pretty ravenous. But I ordered the Vietnamese Baguette (or Banh Mi, to give it its real name). I puzzled a little over the incongruity of food from the Southeast Asia being stuffed into a bread roll until I remembered that Vietnam used to be colonised by France and supposed that it might be the result of some consequential culinary cross-pollination. This Wikipedia article seems to bear my supposition out. Most of the components listed in the diagram above were there, with the exception of 5 and 7. The bread was a little stale, which was a pity because the filling was gorgeous. It had bite, a fresh taste (the filling, that is) and, as you can guess from the chillies, a bit of heat. It was pleasantly satisfactory and left me with the aforementioned mouth-tingle. €4 it cost me. And that, as they say, is what it’s all about. 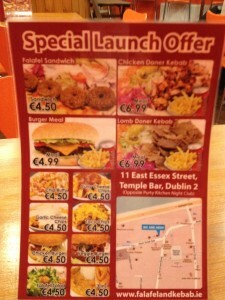 You can read the verdict from cheapeats.ie here. I’m going to return to Aobaba in due course, probably with the older lad who has a grá for things from Southeast Asia, and get his verdict on some of the other items on offer. During the week, I made this. It cost half nothing if you forget about the saffron (and you can, of course, forget about the saffron) and it was quick, easy and very tasty. I had been looking forward to this for a while. 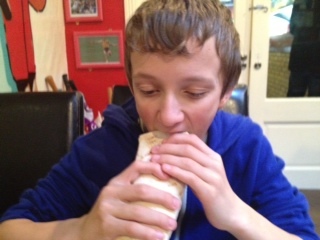 The plan was for the young lad and I to celebrate the mid-point of his mid-term break with a flame grilled feast. 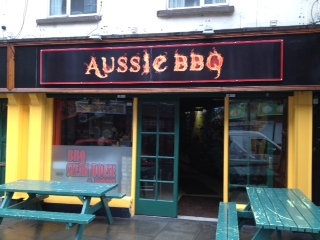 The Aussie BBQ on South Richmond Street was to be the venue. The website looked promising. Inviting even. Inside the main door is a lot of space with a food preparation area behind a long counter. 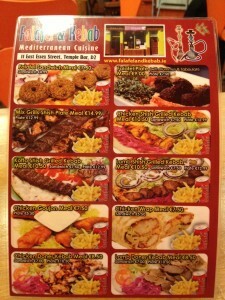 A large wall menu indicates the principal offerings with several items for a fiver or less (wraps, wings, skewers, chips). Another door leads to the ‘Restaurant Area’. A long space with tables against the walls. 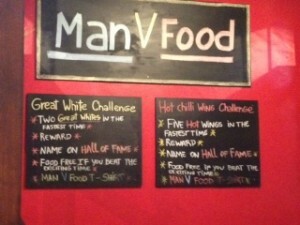 The decor is mainly sport-related, with signed rugby shirts, photos of jockeys, cricket bats and so on. A ‘Man v Food’ -type challenge is advertised in one cubicle. 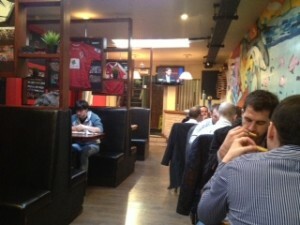 Two large TVs showing last night’s Champion’s League action topped and tailed the eating space. All very male. In a kind-of sweaty, pelvic-thrusting, beery-breath way. Service was friendly and efficient. 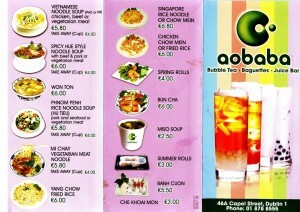 We ordered wraps, chicken for the young lad, pulled pork for me, each €4. Water arrived in a stoppered bottle. The young lad pronounced the water ‘nicely chilled’. Our wraps arrived. The first bite was taken. … but the young lad wasn’t impressed. Asked to elucidate, he suggested that the chicken didn’t really taste of anything. I had a go. He was right. The chicken was in the form of ‘tenders’: strips of breaded, deep-fried chicken. It tasted principally of the oil it had been fried in. The lettuce and mayonnaise in the wrap didn’t taste of much either. Just blandness. 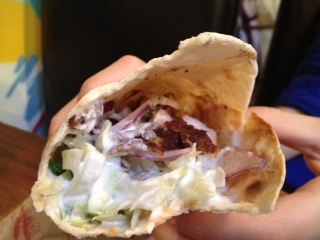 My pulled pork wrap included some coleslaw-type substance and a cloyingly sweet and sticky sauce/chutney. The sweetness was overpowering and not at all pleasant. On occasion I was able to taste pork, and it tasted pork-y but it was difficult to ignore the sauce. I won’t dwell, as we didn’t. The man who took my money asked was everything to our satisfaction but didn’t seem that interested in my polite but critical response. To be fair, the burgers and chips coming out of the kitchen looked pretty good, the place was busy enough and there was a lot of chat. We might have been better to choose items other than wraps. We could have got a couple of chicken skewers and a portion of wings for €9 and that might have provided a better impression of the place. But we didn’t. And we left a little disappointed. A good end to a good week. So, on Tuesday evening, I went to the theatre. Actually, my favourite theatre: the Project Arts Centre on East Essex Street. To see Focal Point*. 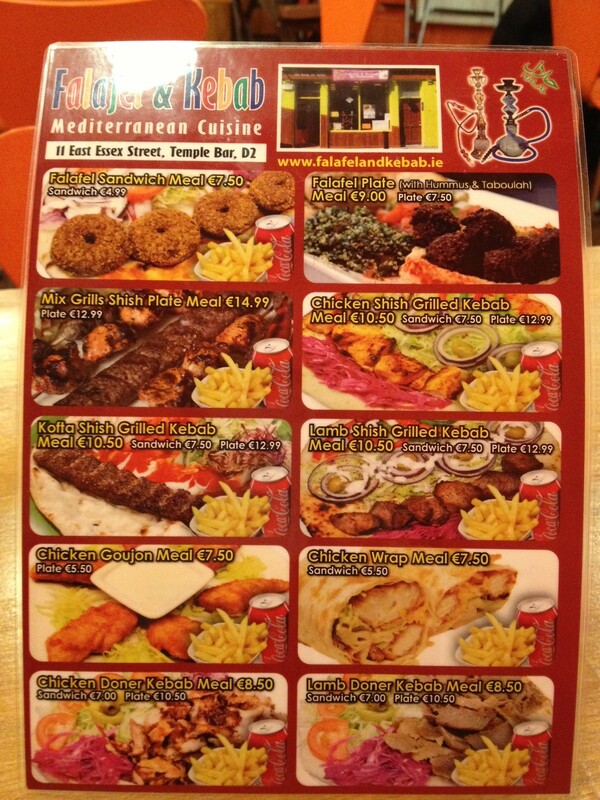 … and, on the basis of the menu posted outside, marked it down for a visit. 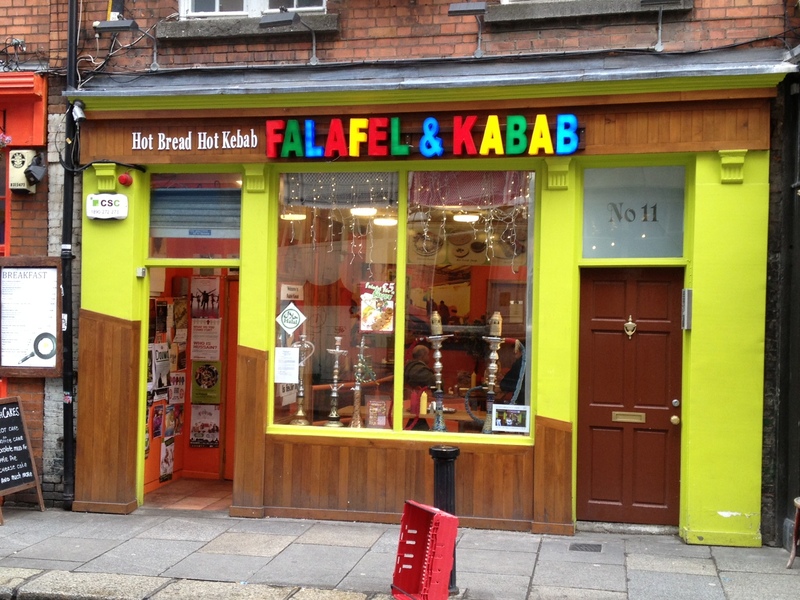 Falafel and Kebab (which seems to be the preferred spelling, despite the sign over the window) has been here for about eight months. It’s clean and well-kept although it looks a little lived in. It has a Facebook page: here. … are not just for show. 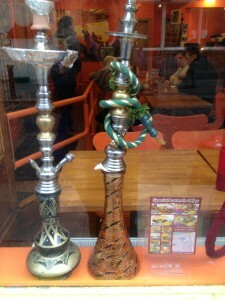 They serve shisha – I saw two men sharing a pipe last Tuesday night. It styles itself as a Mediterranean restaurant, the principal offerings being falafel, kebab (shish and doner), and chicken presented in a variety of ways. As sides/extras, it offers hummus (made on the premises), baba ganoush (however you want to spell it), stuffed vine leaves and tabbouleh (all at a very reasonable price). It also has a tandoor, in which it makes flat breads. 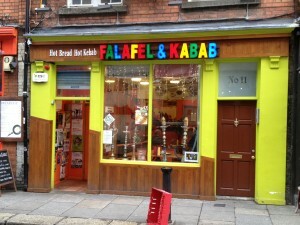 I ordered the Falafel Sandwich for €4.50 from the friendly man behind the counter, took a seat and had a look around. The restaurant seats about 25 people and the predominant colour is that orange you can see just inside the door in the first photo. There are a few wall hangings and ornaments and, although the place is quite small, it doesn’t feel at all cramped. The music was unfortunate (‘Now 66’ or whatever we are up to at this stage). My food arrived, tastefully arranged and delivered to my table gracefully. A fresh flatbread on which were four falafel, some fresh and pickled salad vegetables, chopped tomato, a pickled chilli, hummus and two sauces: garlic and chilli. 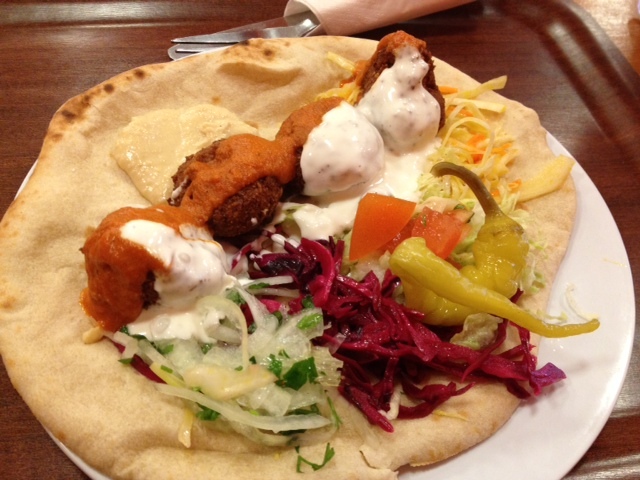 The falafel were fresh tasting, crunchy on the outside and soft inside. The hummus was good, with enough chickpea texture to indicate that it hadn’t been over blitzed in a processor. The vegetables were tasty and varied. There was just the right amount of sauce, and the sauces accurately reflected their descriptions. The bread was fresh, warm and provided a good background to the meal. My lunch was filling, tasty, pretty healthy and nicely presented. The surroundings were comfortable and it’s a place you could hang around in for a while. 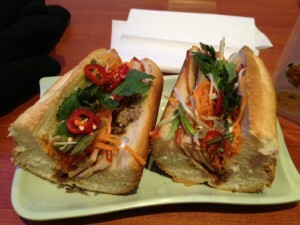 I liked it and I’ll definitely go back to try some of their other offerings. I’d say give it a go. Today, I bought ink and hemp. * Focal Point, the play I mentioned above, is produced by TEAM Educational Theatre, with which I have an involvement. It was written by Manchán Magan, a polymath with a refreshing view of the Irish language and how it is being adopted and adapted by young people. Mikel Murfi directed it with an acute sense of dramatic pacing and the actors, Dónall Ó Héalaí and Jody O’Neill, brought it alive. Great stuff. It ends its run in the Project tonight and goes on tour to schools after half term. 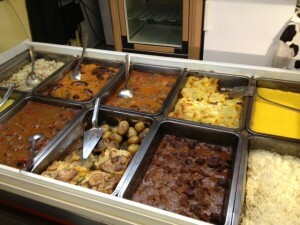 I first mentioned the Balkan restaurant in the Moore Street Mall in my first proper blog entry. That was in July 2011. And I’ve mentioned it a few times since. So, a little guilty that I hadn’t actually got around to eating in it, I decided that it would be my destination today. 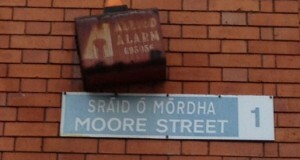 … is at the Parnell Street end of Moore Street. It’s an unusual place. A wide open entrance leads you to an escalator that brings you to a basement. As far as I can make out, the basement is a substantial square, with retail and food outlets located against the outer walls and in two internal prefabricated blocks. There’s a curious mix of shops: two mobile phone repair units, an African hairdressers, a diet supplement place, tattoo parlour and a few Eastern European supermarkets. There’s a Polish restaurant, a kebab/pizza place, a tea parlour, three Asian all-you-can-eat-for-€6.50 buffets and His Food, a tiny Balkan restaurant. Well, it’s tiny inside, with two bain marie units, a salad/cake display unit, two tables and a kitchen area. Outside, however, there are a further eight or so four-person tables (I counted them but I can’t remember exactly how many I counted) so it’s not that tiny. 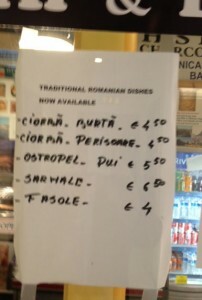 The photo is a bit blurry but the first item is Ciorbă (de) Burtă which is a Romanian tripe soup (more of which later). 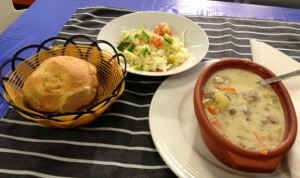 The second item is Ciorbă (de) Perişoare, a meatball soup. For a variety of reasons, I opted for the latter. The soup was ladled into a large bowl by the server (I’m kicking myself that I didn’t find out her name). 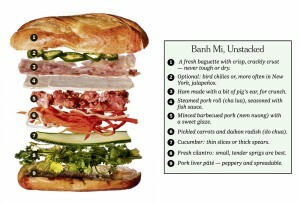 She also gave me a huge bread roll and a small plate of vinegary salad comprising shredded cabbage, cucumber and tomato. All this for €4.50! Result! As you may recall (if you’ve been paying attention), my spouse keeps a soup blog (Minnie’s Soup Kitchen), so I’m more familiar now with the vast range of food items that may be called ‘soup’. This ciorbă was certainly more stew than soup. It consisted of eight walnut-sized beef meatballs in a rich broth that suggested chicken stock and cream, in which were various diced vegetables (onion, carrot and celery) and aromatics (garlic and herbs). The broth was a little salty but I’m probably being a bit picky to mention that. The meatballs were meaty, in a good way. This was a very substantial and tasty meal for under a fiver. Actually, a substantial meal for any price. For the first time in my eatforafiver ventures, I couldn’t finish it. … I bought some and stuck it in the freezer. And threw it out a few months later. Given that history, I was a little nervous when the woman in His Food offered me a taste of the Ciorbă de Burtă. But my goodness. It was gorgeous. It was slimy, yes, but very tender and had none of that unpleasant taste that I remember from my childhood. I’d have a bowl-full anytime. 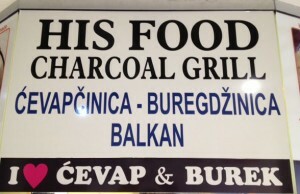 His Food serves good value, filling, tasty Balkan food. There’s lots of choice for under a tenner and it’s definitely worth a visit for those who want to try out some food from a part of Europe that I suspect many of us know very little about. 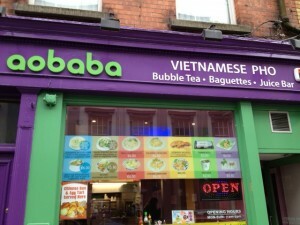 Moore Street is an extraordinary place now. The traditional vegetable stalls are still there, as is F X Buckley’s butchers but now they exist side-by-side with an incredible array of African and Middle-Eastern food shops, hairdressers, phone repair outfits and restaurants selling cheap food. 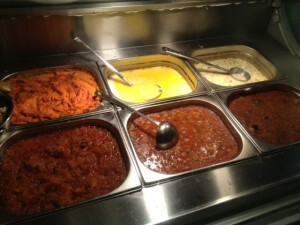 Delhi O’Deli (my first eatforafiver venue) is still there (although its Daily Fiver offering is now €5.50) and has been joined by an all-you-can-eat-for-€6.50 place called Buffet79. On my way back to the car park I called in to PC World and opened eatforafiver.com on all the iPads and Macs.